Arlington County Board vice chair Katie Cristol said the plan to make a stretch of a Rosslyn street pedestrian-only could attract more people to the neighborhood. The county’s long-term plan for Rosslyn includes a multi-block, pedestrian-only stretch of 18th Street N. to replace the skywalk system that extends east to N. Arlington Ridge Road. The Board laid the foundations for that plan last year when it approved adding pedestrian-only streets and low-speed “shared streets” for bicycles, pedestrians and other transit options to its transportation repertoire. And in a conversation with WAMU’s Kojo Nnamdi this afternoon (Thursday) about a proposal to make a street in D.C.’s Adams Morgan neighborhood pedestrian only, Cristol said pedestrian-only streets could help Rosslyn draw more non-residents to the area. “It would foster and facilitate the conversion of this urban core from an area that people travel through to an area that people travel to, and participate in commerce and can live and work and recreate and shop and patronize businesses in a safe and lively environment to do that,” Cristol said of the pedestrian-centric plan. The plan has already had an impact on future development in that area. In July, the Board deferred a plan to reconfigure the nearby Rosslyn Metro Center shopping mall after staff found it would “hinder achievement” of the so-called 18th Street Corridor. Cristol said that while it is important to think about making streets safer for pedestrians and bicyclists, the county is not looking to punish those who would prefer to drive. 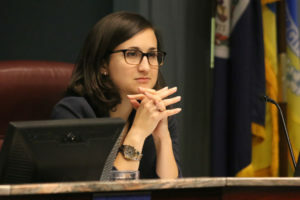 “This conversation for us in Arlington is a little bit less about how do we restrict people’s ability to use their cars, and how do we expand travel options and safety for everyone using our streets,” she said. Cristol said the county’s use of shared streets, which encourage more pedestrians, bicyclists and transit as well as cars traveling at lower speeds, is something it will continue to explore. Shared streets have features like different paving materials, larger sidewalks and improved crosswalks, and already exist in places like Penrose Square off Columbia Pike. Almost every project approved in the county has elements of that in its streetscape, and Cristol said there are “definitely a lot of opportunities for this kind of shared street category” in areas like Courthouse. Sections of 14th and 15th Streets N. in the neighborhood are slated to become shared streets.